Washington County law enforcement leaders gathered in Beaverton on Monday to make a pitch for new funding and investment — not in jails, police cars or officers, but in early childhood education. Beaverton Police Chief Jim Monger was on hand at Beaverton's Vose Elementary School, along with Washington County District Attorney Bob Hermann and the next man to have his office, Kevin Barton of Sherwood, who earlier this month won the election to be the next DA. All three spoke in favor of a nationwide initiative called Fight Crime: Invest in Kids, consisting of more than 5,000 police chief, sheriffs, prosecutors and violence survivors who argue that investment in pre-kindergarten, Head Start and other early childhood education programs are proven methods to reduce crime. The organization includes more than 140 people in Oregon. "We're really just here to support the schools," Monger said. "It's all about the teachers; making sure they have the tools and the support they need." Hermann, who is retiring this year, said pre-kindergarten can help young people long before they get involved in negative aspects of society. "It goes a long way toward getting them past some hurdles in their lives, which can lead to crime. Getting pre-K (to all youths) needs to be the focal point of any crime-prevention strategy." The setting was Beaverton's newly rebuilt Vose Elementary School. Principal Veronica Galvan said the school serves 650 students, with an estimated 80 percent on free- or reduced-price lunch — a federal benchmark for the percentage of low-income families in a neighborhood — and 65 percent speaking a language other than English at home. Vose now holds two pre-kindergarten classes per day, in the morning and afternoon, serving 18 children each and including a meal. During the day, the pre-kindergarten students learn how to interact, how to study, how to help each other and how to sit and listen to a teacher. "The difference is amazing," Galvan said. "This program is literally saving a year for the kindergarten teachers. They get these students (from the pre-kindergarten program) who've learned how to learn." Megan Irwin, administrator of early childhood education for Beaverton School District, praised the program but said it's a drop in the bucket. The district now serves an estimated 200 pre-kindergarten students in five schools; but that's out of a population of an estimated 5,500 students districtwide. Another 300 students have access to Head Start, she said. "So it's a pretty small percentage." Barton, the incoming DA, said the organization is urging state and federal elected officials to fully fund early childhood education. He didn't offer a dollar figure. He said an estimated 21,000 Oregon students, ages 4 to 5, were without any pre-kindergarten or Head Start programs in 2016. "We call on Congress to continue to invest in these programs for every child," he said. Barton also called on pay equity for pre-kindergarten teachers. The three officials read the 1995 picture book, "Officer Buckle and Gloria" to 18 students in Janice Lewis' pre-kindergarten class. The book won the 1996 Caldecott Medal for children's literature. 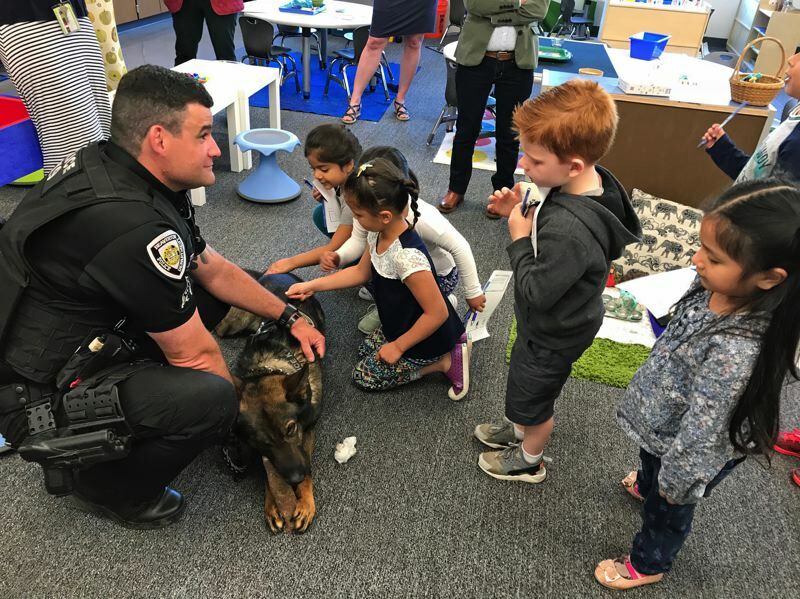 Students also got to meet Beaverton Police Officer Anthony Bastinelli and his police dog, 2-year-old Rizzo.